One of the trending topics on Twitter today was ‘mention a date you will never forget’. It’s incredibly rare that a trending topic is of personal inspiration to me, so I thought I would share my answer in blog form, here. The only date that came to mind was November 09, 1989. That was the day the Berlin Wall came down. I am of German descent, on my mother’s side. I have family in Germany. For the majority of my life, when asked where my ancestors came from, my answer was West Germany. Even though I was raised in Canada, thousands of miles away from the Fatherland, I had spent some time in Germany and always felt a deep connection to my German roots. I never thought I would live to see the day that the wall would come down. 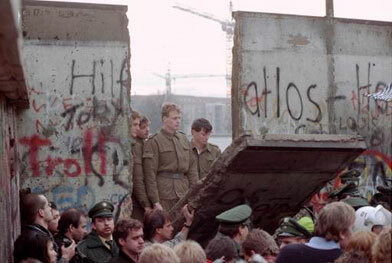 So, that day in 1989, I found myself sitting in front of the television, in stunned silence with tears of unbridled joy streaming down my face as I watched images of the German people tear down the wall that had divided their country for decades. I sat there riveted, as families who hadn’t seen one another for a lifetime were reconnected in rapturous embraces. The Berlin Wall falling planted the seed for a united Europe. Just as a united Europe might one day be seen as the impetus for a united world. A united Germany is proof that we can work together to improve our common future, even if we fundamentally disagree. They say a picture is worth a thousand words, so I will leave you with images of that fateful day set to the powerful music and lyrics of the Scorpions singing Winds of Change… a song that instantly transports me back to that day in November, 1989 and never fails to make me cry. I invite you to share a date you will never forget. The day Ronald Reagan was shot. I was in the sixth grade, and some third grader ran around telling everyone at recess. It was weird – my parents couldn’t stand the guy, hated everything he stood for. And yet, hearing that he might die still shook my little eleven-year-old world to its core.